Honor special mothers on Mother's Day with beautiful Carnations displayed at the National Shrine of Our Lady of the Snows. 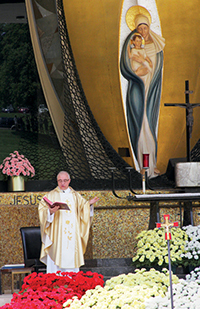 One of the most beautiful events every year at the National Shrine of Our Lady of the Snows is our stunning Mother's Day celebration. Thousands of carnations are displayed that day at the Shrine Amphitheatre, each representing a mother who made a great impact on the lives of her children. One of the carnations this year will be for my Mom, Urzula, who has always been passionately dedicated to taking care of her family. One event that had a great impact on my Mom's life was when my younger brother George was born. Shortly after his birth my brother suffered a stroke and was partially paralyzed. Instantly, all of my Mom's plans were changed as she had to spend much of her time taking care of his needs. My Mom had worked as a beautician but gave up that career in order to be there for my brother George. Doctor visits, rehabilitation and constant care for George was now the major focus of mom's life. She never complained about the responsibility. All these years, seeing my Mom taking care of my brother, I have witnessed her love and dedication in fulfilling her vocation as a mother. Today my brother George is 54 years old. Mom, who is facing her own health challenges, continues to take care of him. And she does so without hesitation, because for her that is simply what it means to be a loving and caring mother. On Mother's Day I will place a carnation near the altar of the Shrine for my Mom as we celebrate a beautiful Mother's Day Mass. I also want to honor your mother, and any other remarkable mother in your life, by placing a carnation near the altar in their honor. Send the name of your mother and other special mothers. Their names will be placed in the Mother's Prayer Capsule here at the Shrine where they will be prayed for by the Oblates and Shrine pilgrims until Mother's Day 2020. In addition, they will also be prayed for at a special Mother's Day Mass at the Basilica of the Annunciation in Nazareth. Select the appropriate value from the drop down and then enter the name of the person on whose behalf you are giving.